Ashdown Forest Golf Hotel is located on the edge of Ashdown Forest offering a quiet surrounding away from traffic and air pollution. There is superb food served in the West 19 restaurant and a vast range of bar meals available in both bars. The Highgate room is a large function room that doubles as a sports bar. The W.B Yeats room, named after the Irish poet who spent his honeymoon at the Hotel in 1917, is ideal for that morning coffee or pre-dinner drink. Three all weather tennis courts are also available. The next is Hatfield - home of Winnie-the -Pooh. M23 J10 take A264 to East Grinstead. Join A22 to Eastbourne and in the Forest Row Village left at small roundabout to B2110 to Hatfield/Tunbridge Wells. Fourth turning on right and veer right at top of Chapel Lane and hotel is on the right. A short course by today's standards, but still as it was 100 years ago, a good test of golf for all levels of handicap. The course is set in the beautiful Ashdown Forest and managed by the Ashdown Forest Golf Hotel. The course was the venue for the English Ladies Amateur Open in 1932. This was won by the late Mrs Critchley, mother of Bruce the Sky TV golf commentator. There are no sand bunkers but small fast greens and natural terrain give this course an inland links feel. Easy walking. This course is one of 14 in the vicinity which the hotel can arrange access to enable a golf tour of East Sussex. Please note that the hotel was demolished in 2003. 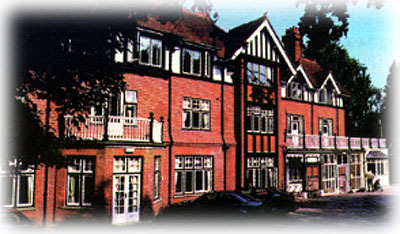 Royal Ashdown Forest Golf Club (www.royalashdown.co.uk) now control the running of both the Old and West (formally Hotel) Courses. so sorry to hear that this hotel was demolished in 2003. I ran the hotel with my husband in the mid to late 1970's but left when the owner died. We lived with our son and welcomed our daughter there when she came back from being born at the hospital in Pembury Kent in June 1978. My son is to get married in December this year and he had booked a room here for a few days not knowing that this was going to be a different hotel to the one he has booked.